I showed you all yesterday some Savina polishes I got. I figured I'd start out showing you 2 of them. 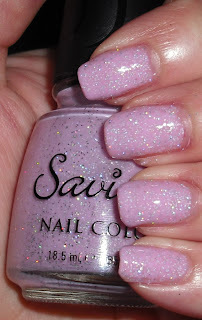 Savina polishes I believe are only sold at Nordstrom Rack stores. They are $3.97 a bottle and are some of my favorites. I think they have been compared to China Glaze. The only thing I personally can say makes them similar to China Glaze is their bottle shape and their unique colors. Their colors aren't all dupes of China Glaze colors if anyone was wondering that. Savina has their share of standard colors, but they also have a very nice selection of unique shimmers, glitters, duochromes, neons, and etc that make them stand out. I find their more special colors to be comparable to beauty store brands rather than drugstore brands. All the colors I got are not colors I've been able to find from other brands. Overall, they get an A+ from me! Purple Confetti is a red-violet jelly packed with holographic glitter. If you love glitter and lots of bling there is no denying the color doesn't offer just that. I love this color! 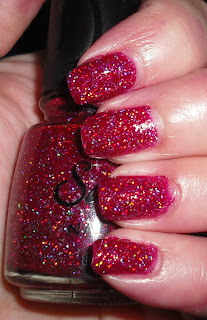 I'm not scared of glitter and this one definitely packs a punch! It's very fun and I love that the base of it is a jelly! Purple Hologram is a lilac creme with holographic glitter. This is probably has just as much glitter as Purple Confetti, but it comes off a lot subtler because the base a lighter color. I love this one too. It's a very sweet girly color. It makes me think of unicorns and fairies for some reason...I'm weird I know this! That's it for today! I'm so glad I found these. The last time I went to Nordstrom Rack they didn't not have Savina polishes out at all. I had went a few months prior to that that and they had a whole wall full. This past time they seemed to have downgraded their selection to only a few small racks, but that's ok I'm glad it's back! Do you own any Savina polishes? Any favorites or colors you really want? I don't own any Savinas, but would like to try some. We have the Rack in Denver so maybe the next time I'm there I'll scope it out. I really like Purple Hologram! Okay, these are both just seriously downright amazing! I'm loving the Purple Confetti, mmm! I finally feel vindicated that you miss Cambria. Does that mean you will go back there with us? Is there a Nordstroms at the outlet malls? I'm working at one on Monday. Will have to check that out cuz I loooovvveee these two!! Those are pretty! I'm going to have to see if I can find them; I definitely want to compare Purple Hologram to Massini/Studio M Purple Medallion. FREAKING LOVE the purple confetti polish. This is the base I want for a franken I've been thinking of for FOUR MONTHS. I've failed at my attempts to make it, but this lacquer would be a great base. Plus, it really is gorgeous. very nice! this reminds me of slammin' red. and the pink is nice too! Pretty pretty glitters! 8ty8beauty.com also sells Savina polishes. That's actually where I first saw this particular brand. I'll have to check some out!